This ebook provides homeowners with the insights about the true difference between a full-service renovation company and everyone else. We describe what must happen for you to have a beautifully-designed and seamlessly-executed renovation that results in the family home of your dreams. 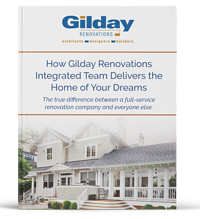 We’ll then discuss how the integrated team at Gilday Renovations uses their skills and experience to create these outcomes for each of our clients.